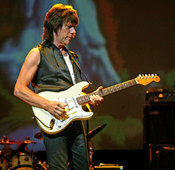 Jeff Beck is indisputably the greatest live electric guitarist. At age 63 he is vastly superior than he was at age 33. His last three albums "Who Else" "You Had It Coming" and "Jeff" are inimitable masterpieces. Jeff Beck also happens to be an animal loving vegetarian, avid gardener and a builder of vintage hot rods. His sold-out shows at Ronnie Scott's jazz club will be spellbinding. Absolutely JB is the Guvnor as described by Brian May. Apparently the Ronnie Scott shows were filmed. And these will hopefully form part of a Beck career retrospective. I pray to the heavens that this DVD will eventuate. I have to have it! I have never seen him perform except for dodgy YouTube footage. Please can we have an official glorious DVD. And please Jeff. Visit Australia!